Commenting on the launch of the sale, Rajesh Magow, Co-Founder and CEO-India, MakeMyTrip said, “As a company we have been focused on driving customers to shift from offline to online for their travel bookings. In line with the recent demonetization drive, we have designed this three-day long event to help customers realize the benefits and convenience associated with making bookings online. We are thankful to all our partners joining us in rolling out this mega travel carnival. 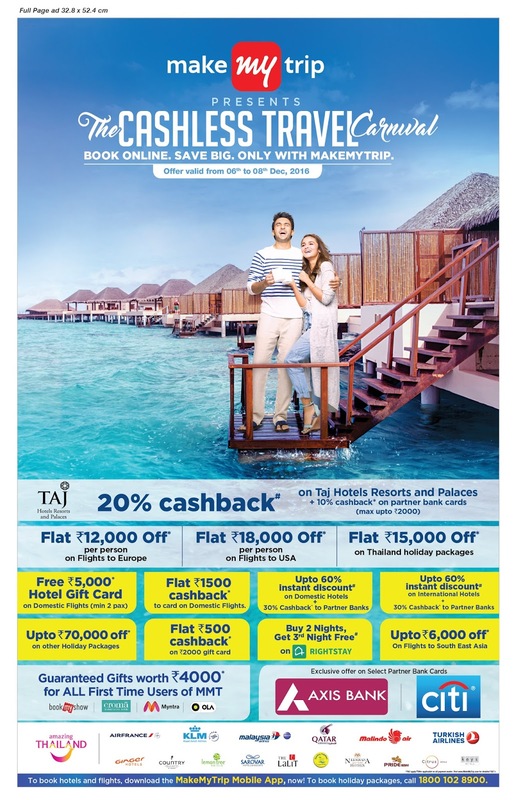 Given the underpenetrated and fragmented nature of online accommodation segment in the country especially hotels where online penetration currently stands at around 14%, The Cashless Travel Carnival offers lucrative deals on online bookings panning a wide range of hotel properties across the country. 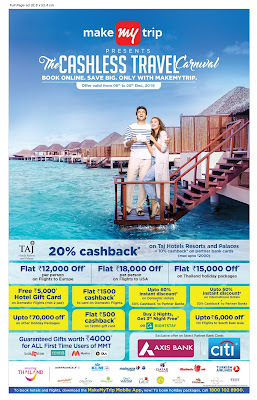 Led by aggressive integrated offline and online marketing campaign, The Cashless Travel Carnival has been built on strong partnership alliances & exclusive supplier participation including Taj Hotels Resorts and Palaces, Amazing Thailand, Air France, KLM, Malaysia Airlines, Qatar Airways, Mailndo Air, Turkish Air, Ginger Hotels, Country Inn and Suites, Lemon Tree Hotels, Sarovar Hotels and Resorts, The Lalit, Sterling Holidays, Neemrana Hotels, Pride Hotels and Resorts, Citrus Hotels, Keys Hotels, Bookmyshow, Croma, Myntra and Ola among others.